A small ball and plastic bottles. To train the ball-throwing skill of children. Let the children align the plastic bottles according to their preference. Move away from the bottles at a distance and strike down all the plastic bottles by throwing the small ball against them. Parents can work with their children and strike down all the bottles together. Alternatively, parents can hold a contest with their children to see who could strike down more bottles. Arrange the plastic bottles into different shapes. 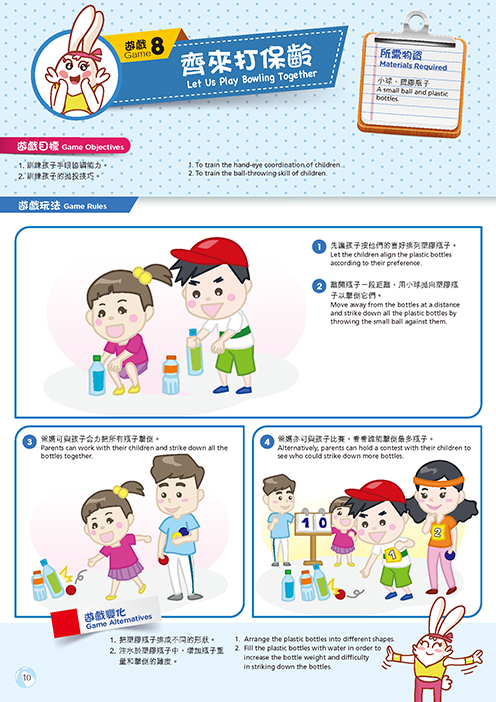 Fill the plastic bottles with water in order to increase the bottle weight and difficulty in striking down the bottles.